Why should you join the BSA? Audiology is the study of hearing and balance and related disorders. There are a range of professional titles that you may come across which are used in audiology. These include Clinical Physiologist (including audiologist and hearing therapist), Clinical Scientist (including audiological scientist and clinical physicist), ENT Consultant, Audiological Physician, Teacher of the Deaf and Educational Audiologist. There are also many research scientists studying the field, often working in partnership with healthcare professionals. b) What is a hearing test? A basic hearing test will measure the quietest sounds that you can hear across a range of frequencies or pitches, from low to high. Additional information, such as how rapidly sounds become loud for you, or your ability to hear speech or speech sounds, can also be undertaken, if necessary. c) Do I need to get my hearing tested? If you feel your hearing is not as good as it once was, or you are struggling to hear, whether in quiet or just in noisy situations, or if you need the volume on the TV turned up , these are signs that it would be worth having your hearing tested. People’s experience shows us that it is much easier to get used to a hearing aid at an early stage, rather than waiting until it may become worse. d) What if my hearing is worse only on one side? It is very important you have your hearing checked out if one side deteriorates. Although rare, there are some serious causes of one-sided (often called single-sided or unilateral) deafness which may need to be ruled out, such as acoustic neuroma. There are many sources of additional information on the internet, for example the Single Sided Deafness website linked here. e) How can I get my hearing or balance tested? Your GP will refer you to your local NHS service. Health visitors and other health professionals can also sometimes refer, depending on local policy. If you want to have your hearing tested privately, you can refer yourself directly. f) How can I get hearing aids? Once you have had your hearing tested, your audiologist will recommend whether a hearing aid might be useful for you. These are available free of charge through the NHS. Alternatively, they are available for purchase through your private hearing aid dispenser. g) How can I get a hearing implant? You can be referred to a hearing implant centre (often called a cochlear implant or auditory implant programme) by your GP, Clinical Scientist, Clinical Physiologist, audiologist, ENT Consultant, Audiological Physician or other healthcare professional responsible for your hearing care. The assessment process will include hearing testing, often including electrophysiological (objective) hearing testing such as auditory brainstem response measurements or cortical testing. There will also be an assessment of your functional (everyday) hearing, such as your ability to understand speech, and how the hearing loss is affecting your life. You may also be required to have an MRI and/or CT scan. A multidisciplinary team will work with you to recommend whether this treatment is appropriate for you. h) What is an audiogram? 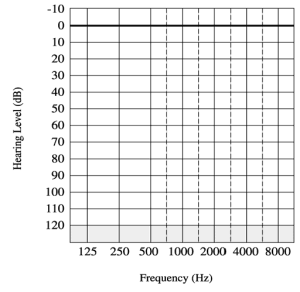 An audiogram is a graph, which plots the quietest level that you can hear at each frequency tested. This is your hearing threshold. In a hearing test, the Audiologist will test your hearing at a range of frequencies from 250Hz to 8000Hz. These are listed along the base of the chart, on the horizontal axis. 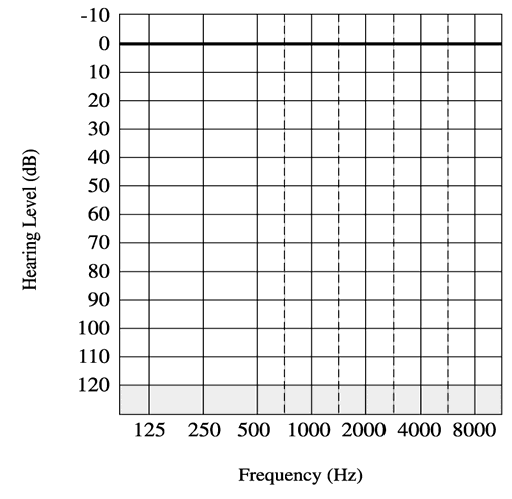 The loudness of the sound is listed up the side of the graph, on the vertical axis. The loudness will be between -10dBHL, which is extremely quiet, and 120dBHL, which is extremely loud. Mild hearing loss: Hearing loss between 20 – 40dBHL (typically you might find that you have difficulty following speech in noisy situations).